With some eyebrow-raising increases in the values of Chicago homes hitting mailboxes in the last few weeks, it's especially important to note that Lakeview Township (which includes all of Uptown) is giving residents the opportunity to appeal their property tax assessments until June 7th. If you'd like to find out more, Cook County Commissioner Bridget Gainer is holding more workshops to help you figure out how to do that. 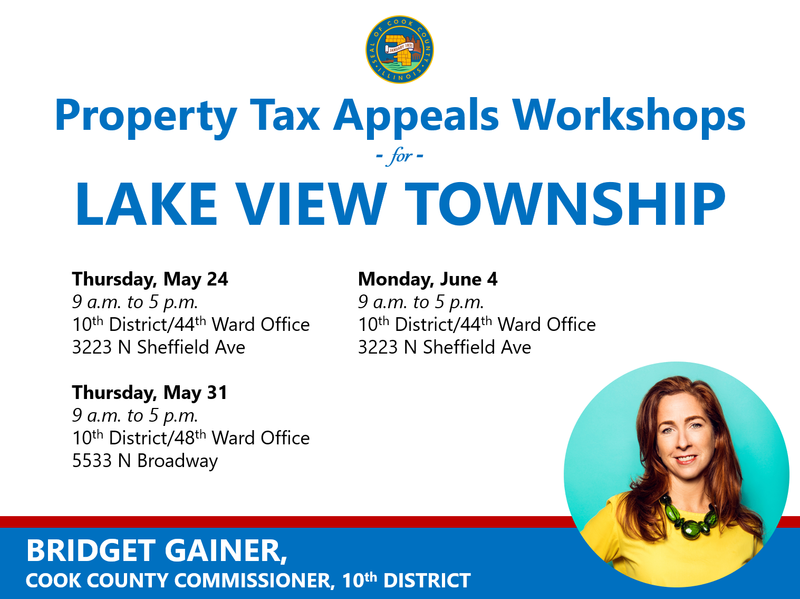 "Please spread the word to family and friends - I am at my Northside district office today (3223 N Sheffield Ave) all day helping residents with property tax appeals. Check below for times and dates for next week - and stay tuned for another evening workshop coming soon. Thursday, May 24, 9 a.m. to 5 p.m.
Thursday, May 31, 9 a.m. to 5 p.m.
Monday, June 4, 9 a.m. to 5 p.m.
10th District/44th Ward Office, 3223 N Sheffield Ave"
As always, feel free to call my office at 312-603-4210 with any questions."